A Comprehensive and Fun Lab Safety Lesson for Biology and Chemistry Laboratories. Help your students become familiar with common lab and safety protocols, using their own lab as a reference. They’ll learn the proper use of common equipment, how to safely use and store chemicals, how to perform proper cleanup and disposal of spills and hazardous materials, and how to interpret SDSs. They’ll also study sterile technique as they work with simulated bacteria and UV light. Finally, to test their comprehension, students will be asked to create their own SDS, as well as watch two video segments and generate a class discussion to cover all of the safety violations that they saw. 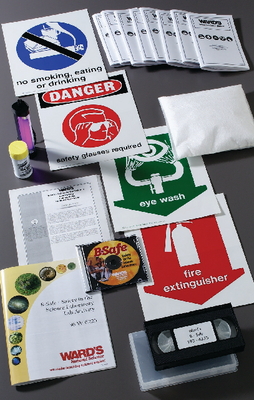 Ordering information: Materials include 8 WARD’S Science Lab Safety Manuals, Spill pillow, Glo-Germ® powder, UV light, B-Safe video, Lab safety signs, PowerPoint® presentation. Materials needed but not provided include Television, VCR, Computer with PowerPoint®.